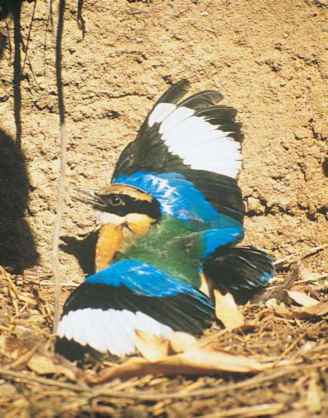 Most lark species occur in Africa, and many have a discontinuous area of distribution and a limited range. Such distribution patterns, in combination with a highly sedentary lifestyle that prevents gene flow between separated populations, are important preconditions for speciation. For example, southwestern Africa is inhabited by six sedentary and closely related Certhilauda species; the short-clawed lark (C. chuana) is probably the sister taxon to a group consisting of five species which were thought to be conspecific until 1999. They are allopatric species; they do not interbreed as their ranges neither overlap, nor are they in contact. larks are of African origin, and that their first radiation took place on this continent. Madagascar was colonized once by the African ancestor of the Madagascar lark (Mirafra hova). 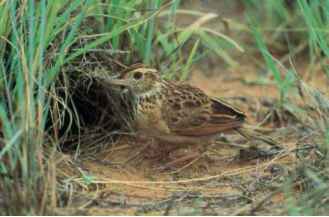 Today, several Mirafra larks occur in Asia. However, it is not possible to say how many species colonized Asia independently, since it is unknown whether the group of Asiatic Mirafra species is monophyletic, i.e., evolved from one common ancestor. During a second radiation, several lineages derived from an ancestor with concealed nostrils, and perhaps this ancestral species was also of African origin. Some lineages certainly evolved in Africa. One lineage led to Spizocorys, others (probably in Asia) led to Alauda, Eremophila, and Lullula. The colonization of Australia by the Australasian bushlark (Mirafra javanica) and of North America by the horned lark happened in the Pleistocene at the latest. During Pleistocene glacial periods, sea level was much lower than today. Sumatra, Kalimantan, and Java (Sunda shelf) were therefore part of Asiatic mainland, and New Guinea was connected to north Australia via the Torres land bridge, forming the dispersal route of the Australasian bushlark. At the same time in the Northern Hemisphere, the Bering land bridge, the continental shelf between Siberia and Alaska, was exposed. The horned lark spread from Asia into North America along this land bridge. Its recent breeding range in North America reaches from northern Alaska to the Gulf of Mexico, and a separated population established itself on the Andean slopes of Bogotá, Colombia. The skylark (Alauda arvensis) reached Siberia from the west approximately 11,000 years ago, after the Bering Strait was formed due to rising sea-levels. This barrier slowed down its eastward dispersion. However, there are records of possible breeding in the 1970s and two well-documented, but probably unsuccessful, broods in 1995 on the Pribilof Islands, Alaska. The skylark's northward expansion toward Central Europe from southern and eastern Europe is closely connected to increasing deforestation and agriculture during the seventh to thirteenth centuries, which provided appropriate habitats for this species. The crested lark reached Central Europe from southwestern and eastern Europe later than the skylark and was widespread in the sixteenth century, but receded during the Little Ice Age in the seventeenth and eighteenth centuries. However, it spread into Central Europe again from the middle of the nineteenth century onward, helped by global warming and man-made habitats such as roads and railway stations. Crested larks even reached Scandinavia in 1900, but became extinct in the 1990s, possibly because of climatic change.